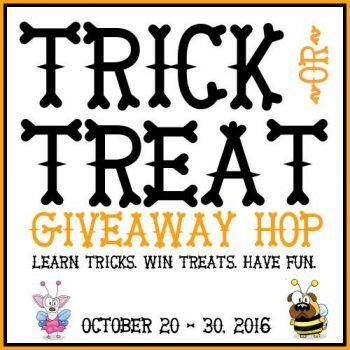 Welcome to the Trick or Treat Giveaway Hop. What is it you ask? Well…… 15 dog bloggers have gotten together and each have written an article teaching their favorite trick. You visit each blog and gather entries to win some amazing prizes listed below. Grand Prize – $300 Gift Card to PetSmart – Yee Haw! Go shopping! Second Prize – Sponsored by Caru Pet Food. Prize is a 14 bag assortment of Caru’s Soft ‘n Tasty Baked Bites and Baked Bars. Estimated value is $100. 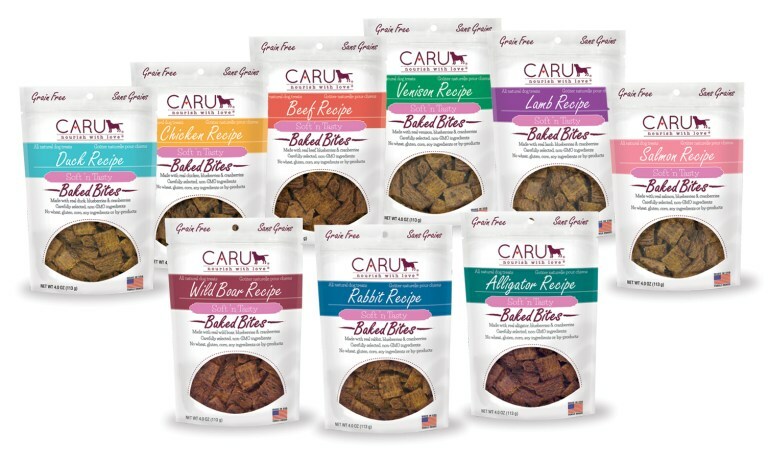 Caru Pet Food makes some tasty stews to add to your dog’s regular diet. They have some amazing treats in many different flavors. Third Prize – Sponsored by Nature’s Logic. Prize is 1 bag of canine beef lung treats, 1 bag of canine beef liver treats, 1 bag of canine beef tendon treats for 3 lbs of treats in total. Estimated value is $80. Nature’s Logic is one of the only dry pet food that has no synthetic vitamins. I have followed this company for a while and I love what they do. They also have some pretty fabulous raw food, treats,supplements, bones and food for cats. Fourth Prize – Sponsored by The Honest Kitchen. The prize pack will include the new Nice Mussels plus Wishes, Pecks (8 oz), Beams (7 oz), Quickies, and Smooches (16 oz). Estimated value is $72. Honest Kitchen makes amazing dehydrated food for dogs and cats. It’s whole food that has been dehydrated and all you have to do is add water. Great for travel and camping. They have some amazing treats too like in this yummy prize package. Winners announced October 31st. Here’s my favorite trick! This is me and my dogs favorite trail trick. It’s the simple action of the dog jumping onto a rock, log, park bench, anything that is off of the ground. Dogs love it, it brings focus to you and they are thrilled that you are engaging with them. Sometimes I find this on the trail! For Mick, when he is getting on rocks and waiting for me, I know he is “with me”. If he is in his hunting mode and seeking things in the forest and not getting on rocks when I ask him, then he goes on leash until he can focus again. Romeo just loves the trail trick and jumps on about 50 rocks in an hour hike, of which I will only reward 8-10, but he still tries, he thinks “is this one good enough for a treat”. When I do give him a treat he is so joyful that he got it right. Goal: when you are out and about, you say your word for the behavior, point or show your dog which object you want them onto, your dog jumps up onto something like a rock, log or a bench. You deliver a treat and then release with your release word. Getting on rocks makes great photo opportunities! Why it’s a good behavior: Your dog is focused on you when you are outside. He is looking for the next object to jump onto. It’s fun! It will make you laugh! It’s very engaging for you and your dog, deepening your relationship. It makes you interesting on the trail. Your dog will focus on you rather than wildlife, dogs, people. The trick is great for picture taking. The reasons are endless, but I guarantee, you and your dog will love it. Lure your dog with a moist, tiny treat up onto a rock that he can jump onto. Not too high, you don’t want shoulder injuries. As he/she gets on the rock, say your word “rock” (call it anything you want, just be consistent). Respond with glee when they are on the object. When your dog is proficient in getting onto rocks, you can work on sits, downs, stand, stay on flat surfaces. It’s really fun! Use your release word, “okay” or whatever you use to get off the rock. If your dog gets into the game and begins to offer the behavior a lot (like Romeo), begin to only reward the really good ones or only the ones that you asked for, your call. I set some criteria for rewards. You set your own, here are mine. If you make me laugh, you definitely get a treat. Individuality gets a great. If you are balanced like you are on a ball, you definitely get a treat. If you have been driving me crazy annoying another dog and now you have gotten on a rock, I definitely appreciate the focus and you will get a treat. Like I said, you set your own criteria for your dog. 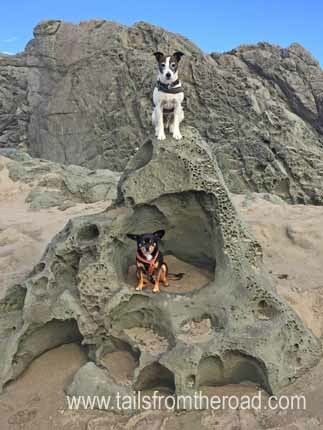 If your dog keeps upping the ante, like getting higher and higher, help them down and do not reward these high places. I’ve encountered that with my dogs. Only reward safe places. When I’m not going to treat a dog on a rock, I just say “good rock” “let’s go”. 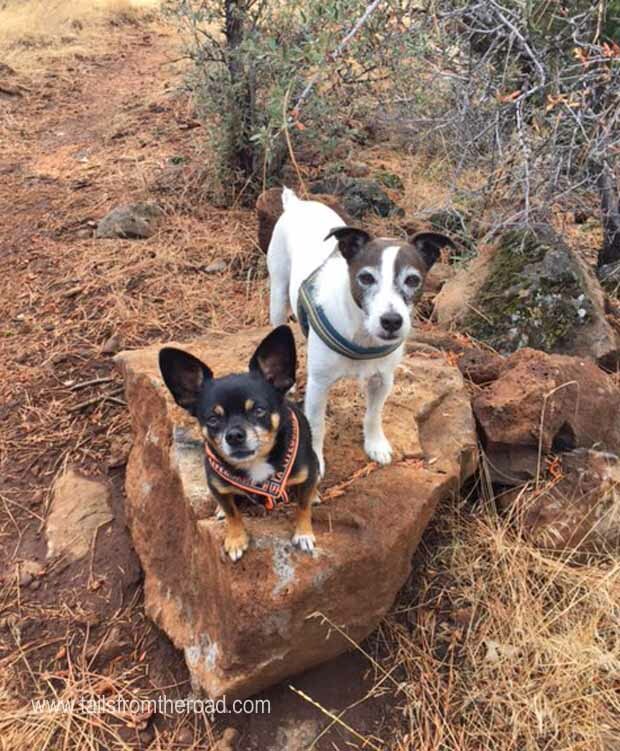 You can use “rock” to get your dogs off to the side of the trail when people or bikes are coming. It’s a great way to distract your dog from anything that you need to, other dogs, people, noises, bikes, bears, deer. The photo opportunities are endless!!! Downside, your dog might want to jump on tables. You might not encourage picnic tables. Use one word for getting on to things. Mine is rock, so if I want them to jump onto a log, the cue word is still “rock”. Here is the next step of the trick. If you have a “wait” or “stay” try this: Once your dog had conquered the “rock” trick, now have him “wait” on the rock, you go ahead 10-20 steps, then release and calm him to you. My dogs go crazy for this trick and now you are practicing three different things, rock, wait and come. Continue to increase the distance you walk away. Now you are practicing Wait or Stay, Release (use your release word first “OK”), and Come. 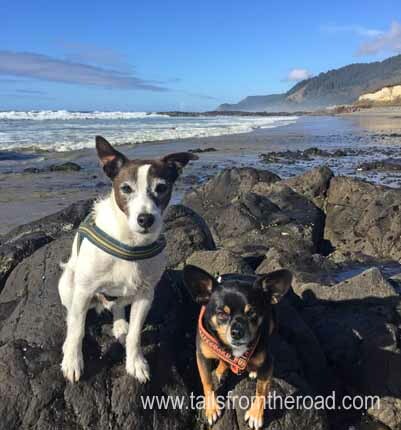 Here is a little video of Mick & Romeo playing the wait game on the trail. Visit these Blog sites from Oct 20 – 30 learn their tricks and get more entries to WIN! 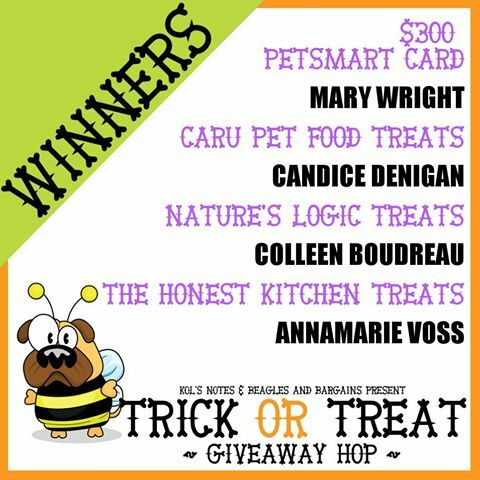 The Trick or Treat Giveaway Hop is a sponsored by Caru Pet Food, Nature’s Logic, and The Honest Kitchen. Thank you to these generous companies so we can share their goodness and have some fun! The Giveaway Hop is closed. It sure was fun! Here are the winnners! Join our mailing list to receive our 10 FREE Places to find Fun & Adventure with your dog ANYWHERE! Cool trick! My dog doesn’t know it yet but we’ll have to try it. I have three rescued Treeing Walker Coonhounds. None of them know this trick, but it would be fun to teach it to them. I’ll have to work on teaching them some of the tricks being presented in this giveaway hop. Don’t have a dog, so no. Cat person that’d love to win the Petsmart card. Any doggie treats would be donated. hey Elenda, I hope you and your dog will have fun with this trick. Thanks for stopping by. Sully knows a version of this trick, but I like your signal for “Wait.” We may have to incorporate that into our training! Thanks! Thanks Shelley, I get Sully knows a lot of things! With a Jack Russell, I have to practice the wait daily! Thanks for visiting the blog. My pup didn’t know this trick yet but we will be working on it soon now! Hey Caitlyn, so glad you’ll add it to your trick box. It’s a fun one. Thanks for visiting. My girl also knows a version of this trick, but needs practice with more unconventional items. Thanks for the tips! Awesome Anne, it’s useful on just about any walk. Thanks for visiting. Good for you Jen, thanks for visiting. Jasper Zen is one awesome trick dog! He doesn’t know this one yet! But always eager to learn more! I hope you have fun with it Allison! Thanks for visiting. Very useful trick! We hike a lot in the Fall and will try this. Hey Collies, it’s a fun trick you can use anywhere. Thanks for visiting. we don’t know this but we don’t spend a lot of time around rocks like this! very cute though! Hey Ellie, you can play this game anywhere. The dog can jump up on a curb, a small landscaping wall, a park bench, everyday things in neighborhoods and parks. Just use your imagination! i don ‘t think my little girl could do this but it’s great! Hey Jordan, no problem that your dog can’t jump up, just try the wait and “come” game. You can play in parks, back yard, dog parks, anywhere. It’s a fun game. My dog has a good wait command. Hello Mary, since your dog is good at waiting, try having him/her wait and then walk away a few steps and call him/her. You can play in a park or anywhere. Dogs love games! You are so good with these two! They always make it look so easy…Have to try this with Daisy & Olive…Cool video! Hey Linda, thanks for the comment. I think Daisy and Olive would love this trick. 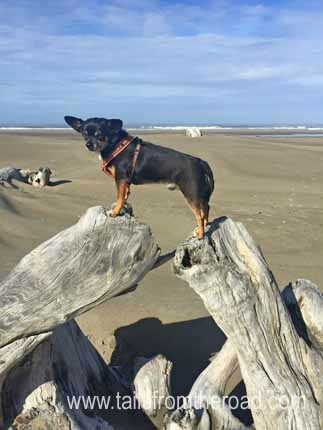 Little dogs love that they can get higher and look out. Hey Devin, I hope you have fun with it! Thanks for visiting! My baby doesn’t know this trick but I don’t think she would enjoy it. She is a fearful english lab and her stocky body really isn’t built for jumping plus she is scared of too many things. I love those pics of your dogs though that is really impressive! I’ve taught big dogs this. Try some low things like a log or a landscaping wall. Teaching your fearful dog new things builds confidence and helps them to overcome their fears. Thanks for visiting Amanda! Thanks for visiting Brandi. It’s pretty easy to teach, it can make your walks a little more fun. So cool! My dogs know ‘wait’ but only listen about half the time. Hey Candice, thanks for visiting! It just takes practice with the wait. 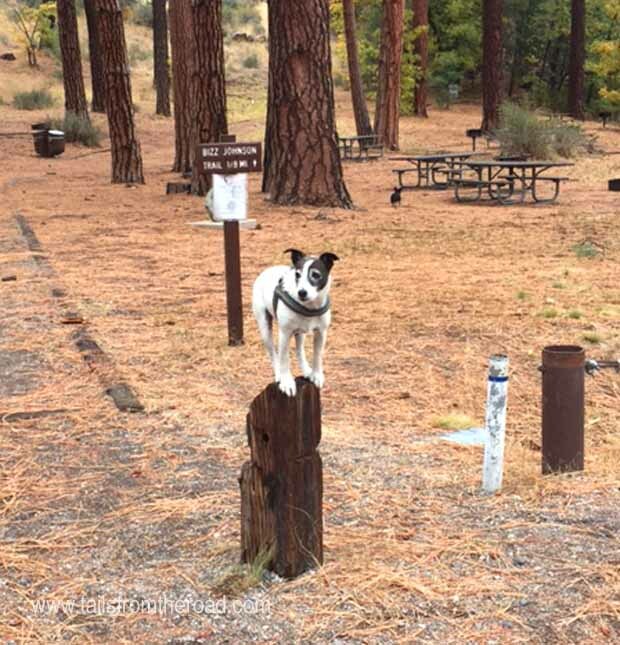 My wait works great most times, but if we have arrived at a dog park or trail head, I have to be super on top of Mick the Jack Russell. If you work in “wait” in to all of your doorways throughout your day, you’ll get better results with the harder ones. Yes, he does although he is not nearly as ardent about it as Romeo is! Mr. N is a true “rocker” for sure! What great dogs you have! I like this trick and can see why you say it focuses them. Nice post. Thanks so much and thanks for visiting. It’s a fun game for me and my dogs. Cute trick and Mick and Romeo are too cute!! I don’t trust my terriers Nala and Cody off leash especially Nala who has an insane prey drive but this could be possible trick for Cody. Hey Amy, thanks for visiting. You can easily do this trick on leash. It will build some value on you while you are outside on a walk. This is a great trick! Wynston knows it pretty well but my girls are still working on it! its very impressive to stand on two rocks! or a smaller one than the pup. I don’t think mine have enough balance.balance for this. Just try something small and low Jess. Doesn’t have to be a rock, could be anything. Thanks for stopping by. I like this one and it looks easy to teach. Our malamute doe not know it. Awesome Sharon, I but a malamute might like this trick. Thanks for visiting the blog! My dog is way to stubborn! Your dogs are so well trained!! Hey Alicia, just find the right treat, think bacon, cheese. Put that treat on their nose and lure them to do what you want. Thanks for stopping by. My dogs don’t know how to do this, but it looks interesting. One of mine doesn’t like to jump real high though. hey Cheryl, no need to jump high, just a couple of inches off the ground will work. We haven’t taken the time to teach our pups any tricks yet. It’s always easiest to work tricks into your daily life. Like wait at the door. It’s useful and something you can practice daily. Thanks for stopping by. Wager *loves* to perch on anything he can possibly jump onto and balance on. Awesome Kate, just be careful so that Wager doesn’t get on anything too high. Thanks for stopping by. Annamarie, dogs loving learning new things! Thanks for visiting. My dogs know wait. I taught them from the backseat of the car. I had them wait until they could leave. Awesome Daniel, waiting at the car door is oh so important. Thanks for visiting! Picture taking is definitely the most important reason for teaching this trick 😃! Well it all started with focus and for Mick the JRT, it still is about focus with him. Picture taking is the bonus! Thanks for stopping by Monica! No, my dog doesn’t know this “trick”. And i wouldn’t want him to know it. I don’t want him jumping or climbing up onto things, anyways. He’s a 100 pound, 7 year old golden. Aaron, there are no dumb dogs, but humans????? katie, you can teach cats tricks too, Same way. Find some treat that they love! Thanks Lara for stopping by! Coco doesn’t know this trick. She is not big on jumping up and down off things anymore like she did when she was a puppy ever since she had knee surgery. Sorry Coco had to have knee surgery. Some easier tricks like “wait” and come might be more well suited. Thanks for stopping by. My dog doesn’t know any tricks. I’ve tried to teach her several times in the past but she just doesn’t get it. This looks like a great trick so I may have to try to teach her this. Rachel, you probably just need to go slower, baby steps. Best of luck and thanks for stopping by. No, our dogs are not very good with tricks or commands. It’s something that I plan to work on. They are always a work in progress like us. They love to learn though, so try one simple thing to teach them like wait for the food bowl. Dogs love to connect with their humans. Oh that is so neat!!! Our dogs do not do alot of tricks yet, but we have started trying to teach them! I have to work on this one! Hello Laura, and thanks for the note. It’s an easy one that makes you the fun one, and if you are the “fun one” then you’ll have better reliability with behaviors that you need. Thanks for stopping by! This is a really cute trick! We hike quite a bit and this would be perfect for taking photos. I am seriously impressed with your dogs balance! Our boys are not quite so nimble! I taught all sorts of dogs this trick when I used to pet sit and take them on daily hikes in Colorado. I had a Golden named Sally, she was a great rocker. Just find what works for you and your dog. Thanks for stopping by. Wow, that is really impressive! I love this. 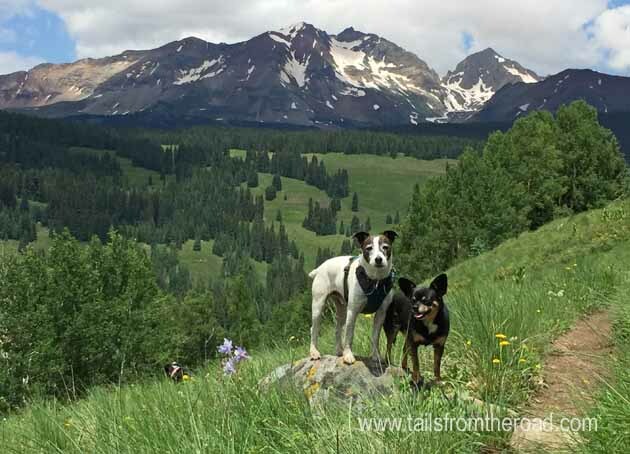 What a great way to make hiking more interesting and fun and to keep your dogs focused on you. We don’t really hike much anymore, but we do walk in the woods some. Luke knows the command “up up” is to get on things, and sometimes I have him get up on rocks and stumps. We are always working on stay so now you’ve given me another idea for working on that! I loved that “if you make me laugh, you definitely get a treat.” Training is so much fun, and I often find myself laughing, even when Luke is screwing up and not doing what I want. That’s what it’s all about! Hey Jan, thanks so much for the sweet note. Dogs should make us laugh, right? You don’t have to be on a trail for this trick. Urban walks are fine too. They can get on a landscape wall, park bench. Sometimes I find empty playgrounds and those can be a lot of fun to play some games. Thanks again for stopping by. This is a great idea! We want to take our dog on more than just walks around town, but on hikes. Our dog is very focused on smells and what’s around the area than us so this is great! Barrie, I would find things on your urban walks to play this trick Easy to do with a leash. Little landscaping walls, parks usually have something that your dog could get on safely. I still use it for focus with my Jack Russell. thanks so much for the nice comment and for stopping by. Great Billy, it’s a fun trick that you can use on your neighborhood walks too. Thanks for stopping by. Great Thomas, then you can teach him the trick! Neither of my pups know this trick. However, I believe that my Pekapoo can be trained to do so. Hello Ann, You can try in your house or on your neighborhood walk. Pick low things for Pekapoo to get on. Thanks for visiting. My dogs could NEVER be off leash. It’s just not in them with their breeds. No problem you can easily do the rock trick on leash on urban walks. I have a tiny mini doxie.. her legs are too short 🙂 But awesome trick! She can get on things that are 2-3 inches off the ground, but you are right, don’t let her be jumping off things. Thanks for visiting! Yes my dog does this. I use the word “up” for it. Ann-Marie, that’s best word for this, or most logical. I use “pick-up” for Romeo my Chi to be picked up, so up is too close to that. Thanks for stopping by! no my 3 girls do not do this outside, maybe in the house on furniture, but not outside. the youngest has straddled furniture in the house and walked along the very edge of furniture. nice tricks. That’s great Laurie, three dogs will keep you busy for sure. I hope they like the trick. Thanks for stopping by. No our dogs don’t know this trick. Hello Nancy, so now you can teach your dogs this trick! Yep, my dog knows this trick. I first taught it for the reason of getting on the weight scale at the vet clinic. Jennifer, that’s a great practical use! Love it. Thanks for stopping by! Several of my dogs do this. We worked on it over time and didn’t have a specific plan for teaching it. My dogs are really people oriented and love attention, so it was pretty easy to get them to pay attention and wait wherever we wanted them . Wait seems to be the word we use. Awesome Sue! Sounds like you have taught your dogs some good stuff. Thanks for stopping by! Romeo looks just like YoYo … 🙂 I use this trick so i can brush YoYo outdoors and i don’t have to bend over to get to my little man . Hello Claudia! Great use! Romeo & Yoyo would probably like each other. Thanks for stopping by. My shelties know a lot of tricks but not this one. Hey Ellen, so glad you stopped by, maybe you can add this one to your bag of tricks. This is one that we taught early on along with sit and stay. Good for you! Thanks for visiting. Mine doesn’t know this trick. Great photos!! Hello Sarah, thanks so much for visiting my site. Best to you! Very smart!! My dog does not know this trick but we should teach it to her before we move up to Northwest with lots of great trails! Great Erin, you are going to love the Northwest. We just spend 3 months there and love, love exploring there. Best of luck with your move. My Boston knows this through targeting but it takes a lot of convincing if it happens in a place he’s unsure of. Hey Wendy, very cool you use with targeting. What a great way to help your dog with some fear. Good on you! Thanks for visiting. Love this strategy to keep your dog focused on a hike. Plan to try it next time I’m out with my dog. I think she will love it. Thank you Carol! So glad you are going to try it out and about. Thanks for stopping by. Let us know how it goes. Bo can sit and shake. And he stands up and loves to hug you. Tiffany, so awesome that Bo has such great tricks under his belt. I love that! Thanks so much for stopping by. My dogs can’t do this trick. This is a trick that Delilah would totes love. Once she ran almost strait up a rock. I swear she’s part mountain goat! I also like to practice different commands on our walks, you are right, it helps keep the focus on you. Great job! Hey Jodi, funny about Delilah. Thanks so much for stopping by! Great Mallory, so glad you’ve been using it. It’s always fun to make up games with our dogs. My Border Collie is awesome with this. She actually knows over 150 tricks, but with this, she is very use to me putting her in/on the most strangest things and waits for a photo taken. It comes really natural with her, most likely because we’ve been doing it since she was a baby pup, and she loves her photo taken. I love Border Collies, used to have 2. They are so amazingly smart and willing. Thanks Tammy for dropping by. I love it! My little gal isn’t able to do things like this. My dogs don’t do this trick. Hey Juliee, we are just presenting this trick as a maybe to add to your trick tool box. No, he doesn’t do very well with this trick! She knows the trick. Sometimes she’s more patient than others. I really just taught her to stay and used praise. Michelle, yes, you can use anywhere, even in your house if it’s a rainy day! Thanks for stopping by. We don’t hike so don’t have big rocks. But we do a similar up with benches. Carolyn, Yes, works great with benches, curbs, little landscaping walls. Thanks for visiting. Cute! My Boston terrier is very food motivated so she catches on quickly. Awesome Patti, I love Boston’s, so fun and gregarious. I bet she will love the rock trick. Great news Caryn, thanks for visiting the site. Hey Starla, big dogs love this trick too! My dog can play dead. Similar technique! No dog. I’d love the gc and any treats, etc would go to my local shelter. That is a great trick to keep your dog safe on the trail – and is very cute! hey Wendy, it might be, maybe just a game of wait and come might be better with a Dane. Thanks for visiting. That’s awesome. your dogs are adorable. My dog does most definitely not know this trick, I do not trust her since she is a runner. She does well on leash and doesn’t try to pull ahead though. Hey Melissa, This would be a great way to work on some focus with your dog. Do the rock trick on leash. Find anything that your dog can get on, can even be a curb. This makes you more fun and engaging when outside. Your dog will love you for it! My dogs don’t know this trick but I’d love to teach them. It does look fun 🙂 Thanks for the tips! Great Joy, thanks for visiting! My dog is working on this trick. She’s a timid rescue but smart and wants to do well. Good for you Heather, teaching your dog fun things will help her build confidence in the world. Thanks for stopping by!